We are sure that we will give you the best solution in every single trouble that you want us to resolve. (Aschers), also known as white calyx, white crane cents, is the Asteraceae Hosta is a perennial perennial plant. Flowers white, tubular funnel-shaped, fragrant, flowering from July to September. Avoid strong sunlight exposure. Product Type:Bonsai. 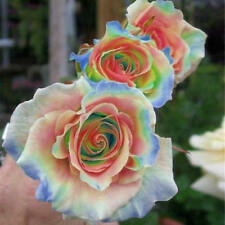 200 Rainbow Rose Seeds. Classification:Novel Plant. Variety: Rose. Use:Outdoor Plants. Usually I will respond in 24 hours. I send goods within 12 hours. Australia, United Kingdom. Aloe is a liliaceous herbaceous plants for many years, many gravy. Aloe vera is not sweet fruit, people take a fancy to aloe lies mainly in its health care function and nutritional value. 100 x Seeds. Product Type: Bonsai Cultivating Difficulty Degree: Very Easy Flowerpot: Excluded Classification: Novel Plant Function: Beautifying Style: Perennial Size: Medium,Large,Small Full-bloom Period: Spring Location: Courtyard Climate: Temperate Applicable Constellation: Aries Use: Outdoor Plants Model Number: Lipstick Palm Type: Herbs Variety: Flower Product Type: Bonsai Flowerpot: Excluded Location: Courtyard Style: Lipstick Palm Type: Cyrtostachys Renda. Datura seeds are sown indoors in individual pots two to three months before planting them outdoors. Placing the pots in a tray with a clear plastic cover or in a clear plastic bag and then closing it tightly will increase humidity. Residents of the village, rural "all around" greening can promote the use of the middle and lower reaches of the Yangtze River afforestation species. Fresh green delicate, strong sprout is the production of stump bonsai good material. Bag with seeds placed in the freezer for 2-4 weeks;. Hello, my friend! A little about the product Soil pH: Neutral 5,5 – 6. Film reveal. Product Type: Bonsai Plant. Bonsai Plant : Purify The Air Absorb Harmful Gases. Hi warm climate. Style : Perennial. Quantity: 30 pcs. Applications: Balcony, garden, living room, study, windows, office, etc. Set the seeds firmly by pushing them into the soil using your fingers. Instruction for Desert Rose from Seeds Remove the tufts from each of the seeds, if they are present. Alternatively, make your own soil by mixing together equal portions of coarse sand, peat moss and potting mix. Cherry radish has strong cold resistance, but not heat-resistant. Product Type: Bonsai Plant. Bonsai Plant : Purify The Air Absorb Harmful Gases. Hi warm climate. Quantity: 100 pcs. Applications: Balcony, garden, living room, study, windows, office, etc. Wall Stickers. Cover Case. Temporary Tattoos. Sports products. School supplies. Kitchen Supplies. Daily necessities. Sweatshirts & Hoodies. Quantity :200 seeds. We will try our best to help you solve any trouble. All parcels need to check one by one. The procedure will take longer than before. Product Type: Bonsai Size: Large,Small,Medium Flowerpot: Excluded Cultivating Difficulty Degree: Very Easy Style: Perennial Climate: Temperate Full-bloom Period: Spring Model Number: Mini Black Pine Use: Indoor Plants Type: Herbs Applicable Constellation: Cancer Variety: Flower Function: Interest Classification: Novel Plant Location: Study Product Type: Bonsai Name: Mini Black Pine Type2: Exotic Bonsai. Full-bloom Period: Spring Type: Blooming Plants Applicable Constellation: Capricorn Flowerpot: Planted with Pot Cultivating Difficulty Degree: Very Easy Function: Beautifying Classification: Novel Plant Variety: Rose Use: Outdoor Plants Style: Annual Climate: Temperate Location: Courtyard Model Number: AAA Size: Small Product Type: Bonsai Product Type: Bonsai Shipping: Free shipping Place of origin: Germany is_customized: Yes. Bark dark gray. Leaves thinly leathery, narrowly elliptic, dark green surface, shiny, entire. Achenes oval. Flowering from May to June. Product Type: Bonsai Plant. Bonsai Plant : Purify The Air Absorb Harmful Gases. Aloe is a liliaceous herbaceous plants for many years, many gravy. Aloe vera is not sweet fruit, people take a fancy to aloe lies mainly in its health care function and nutritional value. 100 Pcs Seeds. Flowerpot: Excluded. Product Type: Bonsai. Model Number: seeds. Variety: palm. Classification: Novel Plant. Location: Courtyard. Use: Outdoor Plants. Product Type: Bonsai Cultivating Difficulty Degree: Very Easy Model Number: bonsai Flowerpot: Excluded Function: Beautifying Size: Mini,Medium,Large,Small Full-bloom Period: Autumn Classification: Canned Plant Style: Perennial Location: Courtyard Climate: Temperate Applicable Constellation: Cancer Use: Outdoor Plants Type: Blooming Plants Variety: Narcissus Color : Mixed Planta: Indoor / Outdoor Plants Use: Beautiful & Fresh Air. Delphinium, Ranunculaceae is a perennial herbaceous genus. More resistant to cold, hi sunshine, fear of heat, avoid waterlogging, should grow in rich and fertile sandy soil. Born in hillsides, grassland, fixed sand dunes. Product Type: Bonsai Cultivating Difficulty Degree: Very Easy Flowerpot: Excluded Classification: Novel Plant Function: Beautifying Model Number: Cupressus Sempervirens Style: Perennial Size: Medium,Large,Small Applicable Constellation: Taurus Full-bloom Period: Spring Location: Courtyard Climate: Temperate Use: Outdoor Plants Type: Herbs Variety: Flower Product Type: Bonsai type1: Cypress Bonsai type2: Rare Bonsai planta: Plante type3: Oriental Arborvitae. The inflorescence is long, the color is red, blue, purple, pink, white. The overall flowering period is relatively long, and the color is bright. It can also be used in rock gardens or potted plants.